Guest blogger Jessica Wallin is the Education Program Coordinator at the Vancouver Biennale. Discover how visiting Vancouver Biennale Open Art Exhibition can facilitate engaged student learning. 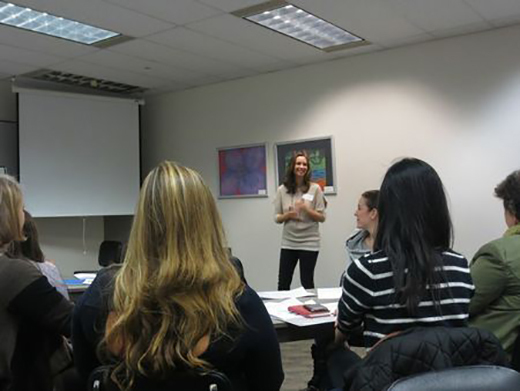 On February 21, 2014, I co-hosted a teacher workshop titled Multi-Media Workshop on Inquiry-Based Learning in Action with Misty Paterson, one of the program advisors of the Vancouver Biennale BIG IDEAS Education Program, at the Vancouver School Board. 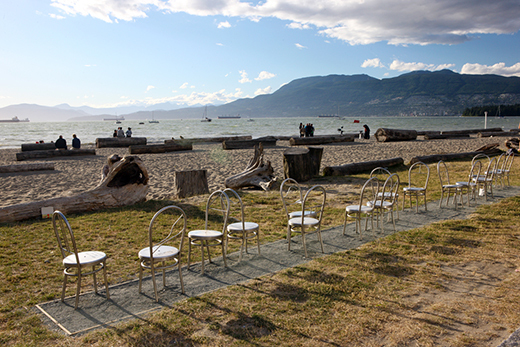 At the workshop, teachers walked into a room with rows of chairs set up in the same configuration as the Biennale legacy installation, Echoes by Michel Goulet at Kits Beach. With sounds of the ocean as the backdrop, teachers sat down and were asked to reflect on the relative placement of the chairs by answering the question "how does your own place or position in society influence your motivation as an active, informed citizen?" Reactions about the simulated field trip were mixed, as some teachers felt relaxed and others daunted at the surprising and new experience. This was followed by a discussion on how a similar exercise could be applied in the classroom. Through altering the sensory experience of the students, teachers agreed that students would be more open to taking different perspectives. 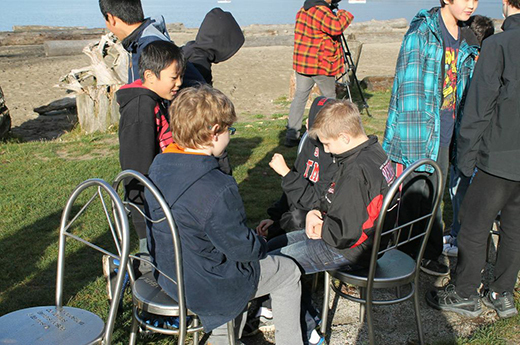 When Grade 6/7 students from Moody Middle School (BIG IDEAS 2014 program registrant) visited Echoes, they sat in the chairs and, due to their placement, began to think about their relationships to one another. Then they discussed the connections between the artwork and the surrounding environment and how the world is interconnected through ecosystems. Upon investigating the poetic etching on Echoes, students shared insights on the big question: "how does art foster awareness of global issues?" Furthering this inquiry, students worked in teams to research geography, resources, human rights and environmental issues of different continents. In groups representing different continents, students explored population density and resource distribution by participating in a Global Village Game. 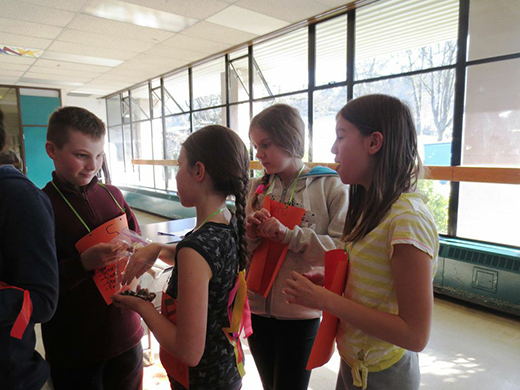 Given chips to represent GDP and different resources, students learnt about unequal resource distribution by trading chips and negotiating with one another. 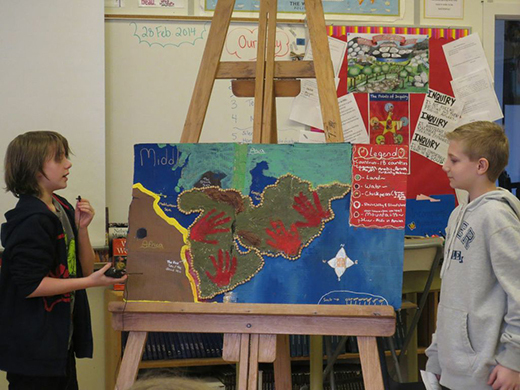 Students furthered their inquiry by creating a mixed media map of their continent with the purpose of showing major geographical features and the cultural elements of their continent including human rights issues and environmental concerns. Using the Google Art Project website, students explored different cultural sites in their continent groups, discussing how art can be a powerful tool for raising social awareness. Students were challenged to explore ways in which art can transform, particularly in connections with the social issues of waste, poverty and the environment. Taking inspiration from artists Aurora Robson, Vik Muniz, the Google Art Project and the continent group exploration, students created their own 3D art installations from recyclable materials representing their continents and key environmental concepts and understandings in regards to human waste. In addition, students shared and presented their findings to their school by creating a drama piece of their learning. Throughout the project, the level of student engagement in the classroom has amazed me. Students were excited to start their lessons and dived into negotiations as continents over resources and creating their cultural maps. I feel the visit to Echoes was a fantastic way to challenge and engage students in their learning and it has been such a pleasure to follow such a great example of how art can be used to teach across different curriculum in exciting and impactful ways. Visiting the school, I have seen many of the challenges and the rewards of using inquiry based teaching methods, engaging the students to be curious about the world, work as a team and to draw connections between many different spheres of their learning. More instructional examples of how linking community to an art inspired learning experience can open the minds of the learners of all ages can be found as part of the Vancouver Biennale online learning resources. The Vancouver Biennale is a non-profit charitable group that celebrates art in public space with the objective to use great art as a catalyst for education and social action. Under the 2014-2016 exhibition entitled Open Border / Crossroads Vancouver we will be bringing international renowned artists and art installations to Vancouver. Our programs include an Open Air Museum, International Residency Program, Cinefest film festival and the BIG IDEAS Education Program. 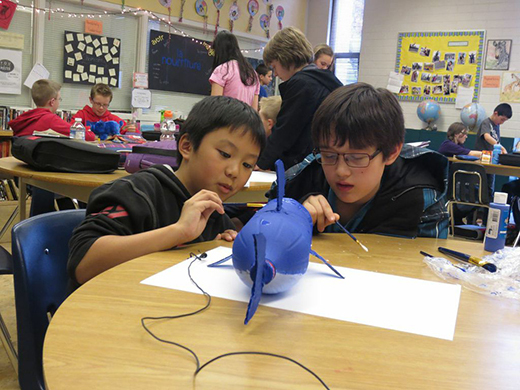 The BIG IDEAS Education Program is an art-inspired, art-infused, curriculum-based learning program that is integrated with the Vancouver Biennale current and legacy exhibition. This year, 1,300 students from 30 different schools in 7 school districts are participating in the program.